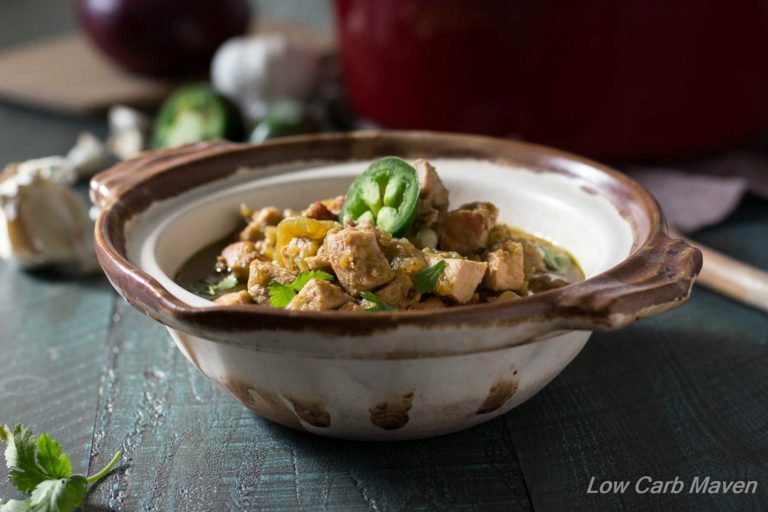 New Mexico Green Chile Pork Stew with Hatch green chiles is an easy low carb stew known as Chile Verde. Serve this version over cauliflower rice, top with a fried egg, or spoon into a low carb tortilla! I am not usually a big Mexican Food fan, but I would eat this kind of Pueblo/Mexican food any day of the week. This was one my dad’s favorite dishes when we lived in Albuquerque, New Mexico. Although we only lived in Albuquerque until I was in the third grade, I still have a taste for this style of food. I lived in the South West for the first third of my life, living in New Mexico, Arizona and Texas (twice), so I’ve eaten a lot of Mexican and Tex-Mex food, but I always seem to gravitate to the most simple of dishes from each region. I moved to Southern California twenty years ago, after getting married. Mexican food here is different. There is a lot of what I call “Taco Shop” Mexican Food. The dishes pretty much taste the same from place to place, although some prepare theirs better than others. Mexican Food in California can be exciting! A good chef can make a wonderful fusion of Asian, Hispanic, and any other ethnic flavors from their local areas. I enjoy those exciting tastes! And, every once in a while, a Mexican restaurant will really stand out as a place one can get authentic Mexican dishes. These are my favorite places to patronize, but we don’t go out to enjoy much Mexican food. Our family has too many food issues, and I have a hunger for more simple flavors in Mexican food, which I can only describe as Pueblo Style. 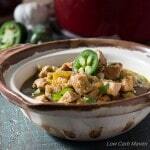 I love this green chile pork stew and always put a fried egg on top. It kind of makes it breakfast, but it’s super good with the egg. Trust me. Super good. 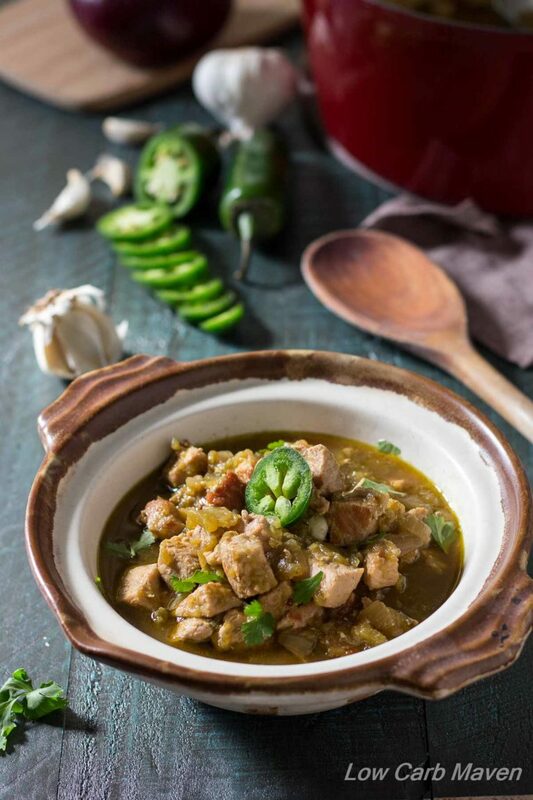 There are as many recipes for green chile pork stew as there are cooks who make it. Some cooks add potatoes to their green chile pork stew, but that wouldn’t be low carb, so I don’t add them. I enjoy it as it is; simple, just pork and chilies. 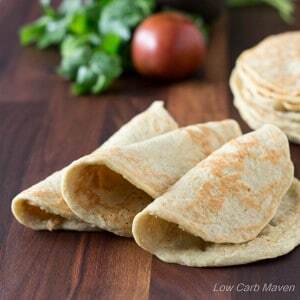 Serve with low carb wraps or over cauliflower rice. This recipe combines two of my favorite things - easy and green chile stew. It's a warming meal to have on a cold day. With a fried egg on top it could be breakfast! Heat oil in a big frying pan and brown the cubed pork loin. Meanwhile, chop the onion and garlic. Open the can of chilies and process with the onion and garlic in a food processor until the chilies resemble a thick chunky paste. Add the spices to the browned pork and stir until fragrant. Pour the pureed chilies, and their juice from the can, over the browned pork. Add the two cups of water, and the liquid from the can. DO NOT ADD ANY SALT - YOU WILL BE SORRY - WAIT UNTIL THE VERY END. Stir and turn pan down to medium-low to low heat. Cover the pan with the lid ajar and Simmer for 1 - 1 1/2 hours until the chilies cook down and the pork is tender. I keep adding a little water up until the last hour of cooking. You don't need to add chicken broth for flavor or the green chile stew will be too salty. It will be very flavorful just by adding water. Adjust seasonings. Ladle into a bowl over cauliflower rice, over zoodles and top with a fried or poached egg (optional). Serves 8. I like to serve the Green Chile Stew over cauliflower rice for a low carb option or rice for the kids. Left overs are GREAT over cheese enchiladas. Instead of buying canned chili’s I want to buy them fresh roasted. They won’t have the liquid though. Will it still work? I see the nutrition info which I appreciate, but what consists of a serving? 1 cup? Hi. I was just commenting because I don’t think your nutrition facts are accurate. I added this recipe to My Fitness pal and in the nutrition facts, it lists it’s 1 carb and 1 gram of fiber. That doesn’t yield 5 net carbs per serving. You also don’t mention serving size. It was delicious though! Hi! Would you be able to let me know serving size? Delicious. Thank you for sharing your recipe. I have always felt that green chile stew does not need a bunch of extra ingredients, and this is perfection. Yes, with an egg on top it was my breakfast today. This was delicious – it reminded me of Chile Verde. Thanks for posting it! Nothing like a good bowl of Chili / Chile! If your eating the best bowl of chile your taste buds have ever experienced it’s most likely made with the world famous Hatch Green Chile / Chili or the Pueblo Colorado Mosco, originating from the Mirasol Chile. Mosco originated from the Mirasol Chile/Chili. Green Chile / Chili Peppers, Mosco Chile / Chili has a great flavor and heat consist of a medium to hot Chile.